The Whole Horse newsletter, Issue #016-- Why Not Bitless? People have asked us why we don't ride bitless since we care about doing things with horses naturally. This is an interesting debate as bitless riding becomes more and more popular. It is important to realise that riding a horse is no more natural than domesticating them in any way is natural. There is no natural way to ride a horse, only more natural ways than others to feed and look after them: extensive management versus intensive. When it comes to riding, our goal is not to do things naturally, it is to find the deepest and purest connection. We want to connect with our horses because it feels amazing! Not only to reach out to another being, but when they reach out to us. This happens all the time between animals and people on an emotional level, but when we can find it on a horse's back, it is also an energetic and physical fusion of bodies and ultimately of minds. In this case does it actually matter whether we ride bitless or not? In a sense it doesn't. All our HHT horses are ride-able without issues in bitless bridles or even head-collars because their flight response is not being blocked by the bit. They understand that, so they are relaxed enough to listen to postural control from the rider. If we are working with horses who have a psychological issue with bits or a physical problem then we don't hesitate to ride without one. The reason that most of the time we do ride with bits however, and we tend to rehabilitate horses back into accepting them, is that bits have a physical function which is part of the circle of engagement, and when they are used in the right way, the completion of this circle with the bit is undeniable. When horses accept the bit they relax their jaw, and this relaxation, linked with the suppleness of the horse's neck, gives a kind of elasticity in the rein which is as 'present' as it is delicate. Because this relaxation in the horse's jaw comes as a result of the horse lifting their back and tucking their pelvis and thrusting through straight and relatively evenly with their hind-legs, it gives the feeling of a sudden ability of the rider to 'reach' the horse. It is like a barrier between horse and rider evaporates and they are no longer separate. The rider's seat is sucked into the horse's back and the rider can feel the horse's whole body surging through to their hands. In these photos the horses are not reliant on rein contact to collect or extend their physique because they are moving in self carriage. The rein contact completes the ring of engagement, of which the happy acceptance of the bit is a part. We believe that these horses enjoy what they are doing because they feel both powerful and secure. 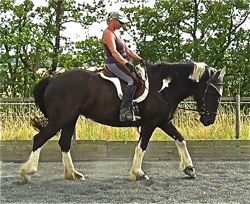 The further they get in their training the more elastic the contact will become and the less apparent the 'slack' in the rein will be (as in the right hand side photo on the bottom). This is because the suppleness in their body takes up this slack. It is not the same as holding the rein tight or a horse leaning into the rein. 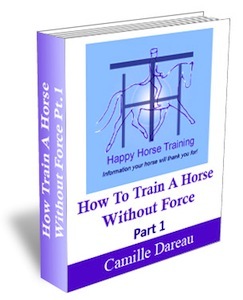 This work using a bit is not the same as blocking the horse's forward momentum, attempting to re-balance them by hoisting up the front-end, or - more commonly - simply holding oneself into the saddle and re-balancing oneself with the reins. The only way to feel this engagement consistently is to be systematically train your body beyond the need to rely on all these misuses of the reins, by riding preferably without access to the reins, or otherwise without contact in the reins. Riding bitless is contacting the horse in a different place, and as it cannot stimulate the same nerve endings, it is less direct. In our experience it is therefore less refined. This is not the same as the mythical claim that the severity of a double bridle can be justified by it's superior refinement. In the case of the double bridle, it is the threat of pain and the pain itself from the curb chain and poll pressure which forces a horse to 'round up and lift up into a false lightness. The first step is that the horse be comfortable in their mouth from good dentistry, then comes the use of an ergonomic and well-fitted simple mouthpiece. Observing that the horses are happy to accept their bridles, responding to any resentment which arises without hesitation, and finally riding in a way that respects the horse's whole body as well as their mouth, are the goals we aspire to. We also now use Micklem Multibridles which have an attachment to prevent the bit jerking back accidentally against the horse's mouth at any time. We genuinely do not believe that well-fitted and well-shaped bits hurt horses' mouths. Unbalance and untrained riders do hurt horses, intentionally or not, with or without bitless bridles. Riding bitless is not a substitute for riding well, although it may be a better idea if the motivation isn't there to improve! Checking out your basic ability to balance yourself when riding is an important step towards respecting the whole horse's body, not just their mouth. There are many different ways, the first step being to give away the reins out to the buckle, so make sure you are riding in an enclosed area if your horse is not used to this, and give the reins out gradually at a time when your horse is relaxed and listening to you. 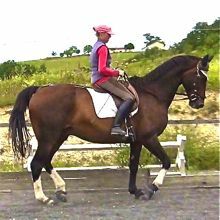 The ideal way to learn and continue to improve throughout a riding career is on the lunge, where practicing with and without the rein contact is most straightforward. 1) Making figures in the school such as changes of rein, circles and serpentines without the rein contact. This indicates the degree of reliance on the reins for guiding the horse as opposed to rider and horse moving as one as a result of postural connection. 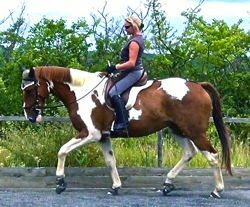 Remember young horses need more indication from an opening rein while they are learning to connect with a rider. 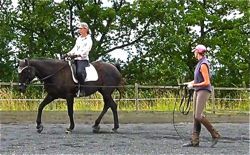 This is a young horse learning to be directed from the rider's postural aids and an opening rein. 2) See how long you can stand in the stirrups without losing your balance. You will need to incline your upper body slightly forward and keep your lower leg underneath, as in the rising phase of rising trot. 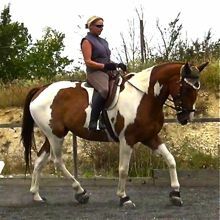 Next see how well you can turn the horse in circles and changes of rein like this keeping the reins at the buckle. This exercise indicates the level of postural balance, the correctness of the rider's weight and how well the horse will yield to weight and leg influence. If the rein contact is necessary then it is compensating for postural weakness. 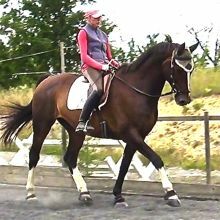 3) Work in sitting trot on a long rein to check your horse's posture and how much it is influenced by the contact. If they have been training in self-carriage, when a horse is given the reins they will stretch into them and form a longer parabola, but not come into a hollow posture. 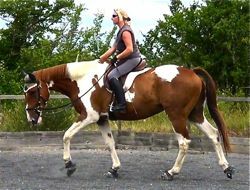 These photo's show Mojo coming from working trot in self-carriage into walk on a long rein. 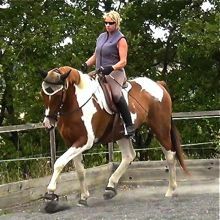 He shows that he is not relying on the rein contact to fix him into a neck shape. The reason he is rounding his neck is the physiological influence of engagement. He is a horse who is not naturally elegant, but his training gives him a different perspective on life and he is proud of his accomplishments! Have a look at our new page Natural Dressage: A True Definition for more about our own perspective on this way of riding.